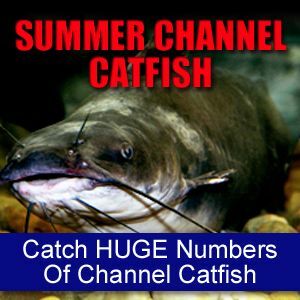 The Summer Channel Catfish Techniques eBook (an eBook is a digital download PDF book) is a step by step guide on exactly how I go about finding and catching channel catfish during the summer months. It covers everything you need to know to find and locate channel catfish during the months of June, July and August. The exact locations and depths to look for, the exact baits to use and the exact when where and how to find and catch channel catfish. It’s over 140 pages jam packed with information on finding and locating channel catfish. Instant download - Get started immediately! More channel catfishing information than I could ever cover in several summer guided catfishing trips on the water. Techniques that work on any lake or river in United States in full detail step by step. Channel catfish species information so you can understand their habits and behaviours. An in-depth guide to the right tackle, baits, reels and hooks so you can stop wasting money on overpriced gear that you don’t need or that doesn’t work. My short list of the best catfish baits that work each and every time. Stop wasting time and money looking for that “magic” catfish bait. Exactly what baits to use, when to use them and exactly how and where to get them. Simple tips to ensure you use the right catfish rigs each and every time. Exact details and information on how water, wind and weather affect channel catfish behavior – stop guessing where the fish are and why they are there. Simple tips on getting more fishing access without a boat and how you can put forth just a little more effort and unlock a whole new world of fishing opportunities. Boat control secrets so you know exactly how to position and anchor your boat. Stop fighting your boat and focus on fishing. My golden rule for channel catfishing that will instantly increase your success on the water. Exactly how long to sit in each location and what to do to assure you have covered all of the water to assure there are not active feeding fish there. The exact techniques to use each month, day and night and exactly where to fish each and every time, down to the very last detail.. Some simple structures in lakes and rivers that drive channel catfish wild. It’s so crazy they are almost like a channel catfish magnet. A little known technique I use that produces monster channel catfish all summer long using a secret technique for targeting channel catfish during the middle of the day. How the sun has huge effects on channel catfish, where they hold up and exactly how to find them. Some simple concoctions you can mix up to explode your catch ratios. Exactly when/where/how to use these concoctions in detail. How to adjust and compensate if the fish are not biting in the area you are fishing and a simple adjustment that can often times make all of the difference in the world. The last resort technique for catching catfish that is so easy that anyone can do it.